In our current research on the vast hinterland of the ancient city of modern day Amman, Hellenistic Philadelphia, Biblical Rabbath-Ammon, we have been reading many travellers' accounts of exploring the ruins of the lands of Moab and Gilead. 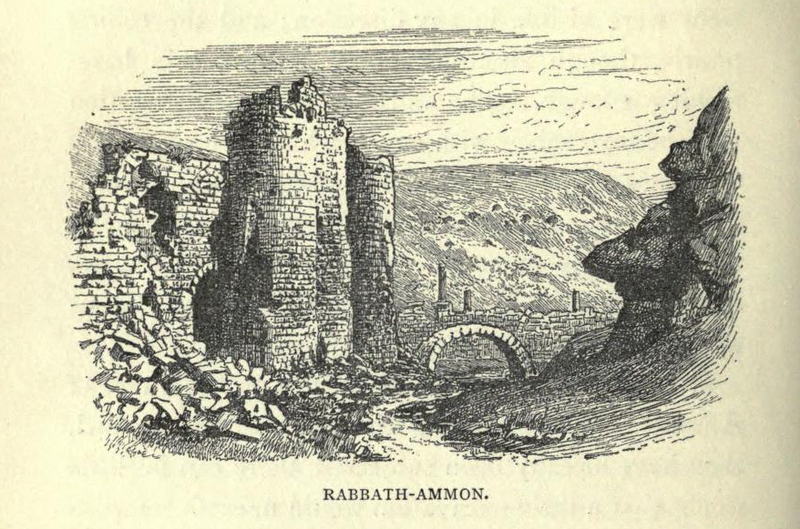 Sketch of Rabbath-Ammon from L. Oliphant, 1880, The Land of Gilead with excursions in the Lebanon, William Blackwood and Sons (Edinburgh/London): 264. Digitised by the Internet Archive. These historical accounts were mostly written in the 19th century. Some accounts seem to dwell on the flea-bitten sleepless nights in Bedouin accommodation, their finesse, or lack thereof, of dealings with the Arab tribes to secure guides and protection on the perilous journeys to isolated historical sites, and anecdotal commentary on the lifestyle of the 'Musselman', Christian and Bedouin they come across in these territories. Other accounts, such as that of Tristram, are overwhelming concerned with the flora and fauna of the region. Most important for us, however, are the references to and reports of ruins they come across. Most accounts try and attribute the sites to those towns and cities mentioned in the Bible, but many also refer the sites to passages in Pliny the Elder, Josephus and other ancient writers. Moreover, as these travellers were making their way through this area well before any urbanisation had occurred, they preserve, sometimes only in passing, the existence of ruins that have long since disappeared. These may be the only such reference to these sites, and it is from these accounts we can hope to reconstruct an idea of the hinterland of Amman - now completely covered in the urban sprawl of an increasingly expanding modern city. Many of these accounts are also accompanied by sketches and maps which further help us identify and locate these sites now erased from the archaeological record, or simply waiting to be refound. Many of these works are out of copyright and can be found digitised and accessible for free in places such as Google Books, the Internet Archive (http://www.archive.org), and Hathi Trust digital library (http://www.hathitrust.org/). Students, right in this blog post you will learn best dissertation committee tips. Check them out!